The Probst Jumbo JM is the economical, easy and exact way if laying slabs upto 200KG. Lifting of products is done using a vacuum hose, making the task of laying slabs extrealy easy and light. 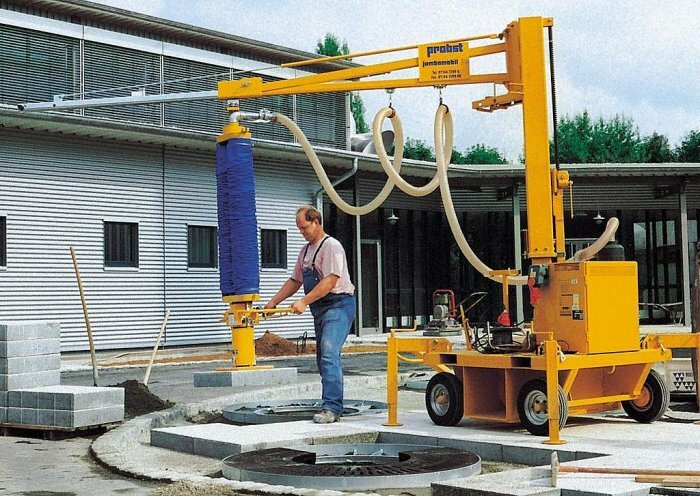 All type of slabs can be layed using the the Probst Jumbomobil JM including concrete slabs, natural stone, slabs with exposed aggregates, karge pavers, and gutters. The correct use of this tool allows upto 300Sq metres of laying to be done per day. Extracing already layed flas is also an easy operation with the JUMBOMILE JM.